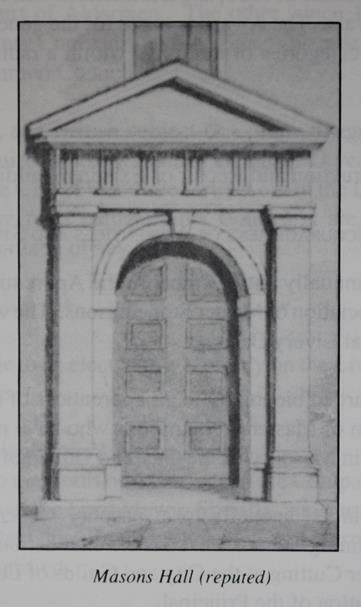 “…on this plot of ground was built the hall and certain tenements; that there was a gateway serving as an entrance, with a small chamber or lodge over it for the porter; that this opened on a small courtyard, which served as a storage for forfeited stone; that at one side of the courtyard was the hall, a long building with a screen, and doubtless a minstrel’s gallery over, together with a parlour for the meetings of the court, and a kitchen, with three chambers and a garret over them, usually occupied by the clerk or beadle”. 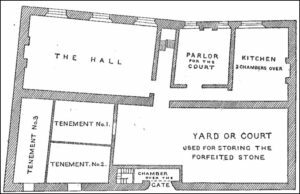 Ground plan of the pre-1666 Masons’ Hall. “1865. Oct. 5. Sale of the Hall. This day the Court of Assistants agreed that the offer to purchase the freehold of the Company’s hall be accepted, and that the clerk be instructed to prepare a contract to carry this resolution into effect”. And so ended four hundred years of history. The reputed doorway of the post-1666 Masons’ Hall. 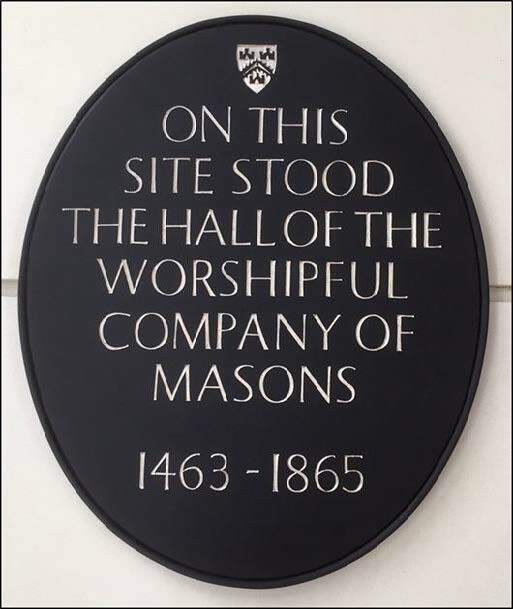 However the Hall’s site was not forgotten and indeed was remembered for many years with wording cut into the granite fronting of 12 Mason’s Avenue – an important inscription that disappeared when the new Mass Concrete facade was installed in 2012. 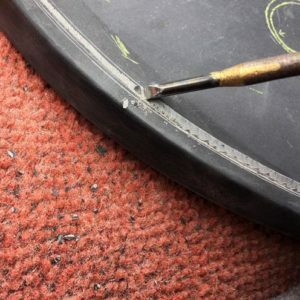 Keen to rectify this omission, Past Master David Blake doggedly pursued the matter through 5 different landlords and multiple building managers to secure agreement for the installation and part-funding of a replacement. 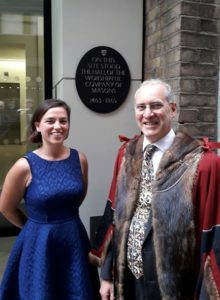 The new plaque was designed, cut, gilded and installed by Freeman Catherine Martin of James Stonework is made of Welsh Slate and was cut by hand at Catherine’s workshop. Carving the beading and lettering. Gilded with palladium (as silver tarnishes outside) the project has finally come to fruition and been greeted with approval by the Court and Ms Kathryn Stubbs form the Historical Division of the City Corporation’s Department of the Built Environment. The completed sign was installed on 03 July 2018 and inspected by the Master and Court a week later on 10 July 2018. The new plaque was designed, cut, gilded and installed by Freeman Catherine Martin of James Stonework is made of Welsh Slate and was cut by hand at Catherine’s workshop. The Master and Freeman Catherine Martin inspect her work.